The Bristol SU was developed by Bristol Commercial Vehicles at the very start of the 1960’s. It was designed and built in two forms. The short version, “SUS” and the longer version the “SUL”. It was supplied with an Albion EN250H four cylinder engine that was also used in the Albion Nimbus. Bodywork was by Eastern Coachworks and was supplied in both bus and coach format on the SUL chassis. Western and Southern National had 133 SUs of which there were 81 buses, 16 SUS buses and 36 SUL coaches. Production finished in 1966. The coaches are the subject matter of this video programme. 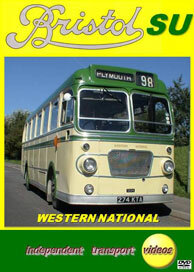 Our filming begins at the Stokes Bay annual bus rally near Gosport on the south coast in 2005. We board 1224 (274 KTA) a beautifully preserved example for a run to nearby Stubbington with 425 (275 KTA) equally as smart following behind. At Stubbington we change vehicles and film the run back to Stokes Bay on 425. You can experience the ride on these lovely little coaches from the 1960’s as we run along the coast almost believing you are back in Devon or Cornwall which was home to these vehicles during their life with Western National. We then take another ride on 1224 on the Road Run, which is a feature of this rally. From the south coast of England we then go north to Scotland to the Scottish Bus Museum at Lathalmond in 2011, for a ride out to Dunfermline on board an earlier preserved example, 1202 (336 EDV). Again you can enjoy the sights and sounds from this lovely coach as we drive through the Scottish countryside. The next ride is also on board 1202, this time in 2013 in North Wales, at the annual Llandudno Transport Festival. This time we run into Llandudno and return along the sea front, with our final shots on the top of the Great Orme. We finish our programme with some cine film footage from the camera of Graham Thorogood. Here we see the SUs in service on their home ground in the West Country. So take your seat for a nostalgic trip back in time.